KEY FEATURES: Fleshy herb to 100cm. STALK cylindrical, to 25cm. LEAVES sword-like, to 100x7cm, stiff, erect to arching, golden yellow. FLOWERS stalk to 30cm with c.20 flowers; FLOWER stalk ~1cm or less, white, erect tube to 8cm, with linear petals (=lobes) to 75x5mm. TAXONOMY: PLANTAE; ANTHOPHYTA (=Angiospermae); LILIOPSIDA (=Monocotyledones); LILIIDAE; Liliales; LILIACEAE. 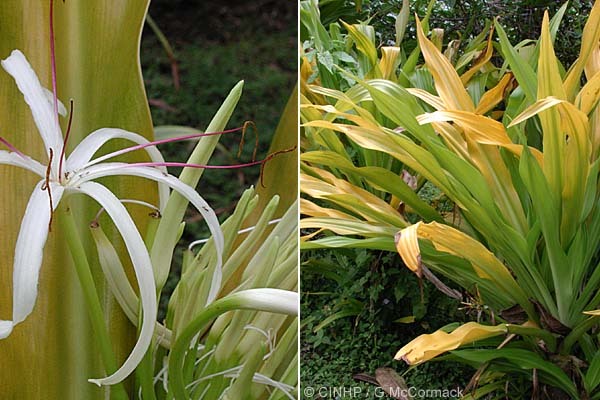 COMMENT: See note under Crinum asiaticum. Pukapuka: fieldspecimens, very common, 2/2004, ID GMcC.